We offer same-day full arch fixed temporary implant restorations in just 1 visit! One Team. One Place. One Price ! - no driving around required! Latest Technology. Cutting-edge Dental CBCT (Cat scan) with the most advanced dental implant planning software to ensure the safest and most accurate surgery. Laser to help treat and and sterilize gums. Utilize latest materials and technique to achieve predictable results. Most skilled doctor. After deciding that dental implants are the right decision for you, choosing the right doctor is your most important decision. The surgeon's training, skill, and experience should be taken into account before committing to any procedure. Commitment to excellence. Our team is committed to both our profession and to our patients. If you seek the very best that dental implants have to offer, look no further. We truly listen to our patients and do all we can in order to achieve the smile of your dreams. Dr.Charlie Chen has extensive experience in surgical and restorative implant dentistry with emphasis on complex full mouth dental implant reconstructions. He obtained Doctor of Dental Surgery degree in Stony Brook and had completed a residency in Long Island College Hospital where he was awarded resident of the year. Dr.Chen has over 10 years of experience in implant dentistry and has received fellowship in dental implant training in the prestigious NYU School of Dentistry. Dr.Chen also had obtained fellowship status in the prestigious American Dental Implant Association. Dr.Chen has performed over 12,000 dental implants procedures and has pioneer new dental implant and bone grafting techniques in which he routinely teaches other dentists. Dr.Chen emphasizes immediate loaded full arch all-on-8 dental implant procedure where he pioneered many new techniques so patient can obtain same day fixed temporary restorations. 1. Simply walk in (No appointment necessary for the first visit) to our implant center at 5321 7th Avenue, Brooklyn, NY 11220 for a complimentary consultation. Dr.Chen will be at the center at Sunday, Monday, Tuesday, Wednesday, and Thursday - from 10am to 6pm. At the first appointment, a 3D catscan / CBCT (also complimentary) of your mouth will be taken Dr.Chen will personally meet with you to determine whether you are a good candidate for dental implants. Dr.Chen will formulate a best plan that will meet your goals and discuss the plan in detail. Many times, Dr.Chen can accommodate patients who are willing to start treatment the same day. 2. If you have any questions, you may email (including x-rays) Dr.Chen directly at bj90688@yahoo.com. You may also send text message to our office line at 718-576-3187. Dr.Chen will do his best to answer all your questions. Dr.Chen specializes in All-on-8 Implant solution providing a stable, titanium reinforced bridge for the entire upper and/or lower set of teeth in just 1 visit. This procedure is best for patients currently in complete set of dentures, or with significant dental problems where teeth loss is imminent. The All-on-8 implant procedure consists of placing 8 dental implant and placement of a stable fixed zirconia restoration where patient can smile and eat their favorite food on the same day after surgery! Using advanced technologies including CBCT, 3D scanners, dental implant planning softwares and talented technicians. We are able to plan the ideal outcome for our patients. We take great care in providing restorations which not only functions but also look and feel like natural teeth. Combining experience of more than 12000 implant procedures and the latest minimally invasive dental implant surgical techniques, we are able to give patients implants, even if they have been told "no" by other dentists. We strive to go "above & beyond" for our patients. We have patients from all around the world. Our advance procedures produces consistent and lasting results for thousands of happy patients. Dental implants- Single dental implants, multiple dental implants, all-on-six dental implants, all-on-seven dental implants, all-on-eight dental implants. All dental implant cosmetic restorative work. All dental implant related bone grafting include ridge augmentations, sinus lifts bone grafts, and gum grafts. Rescuing or redo of other fail or failing dental implants done by other offices. Dental extractions including wisdom teeth. Cosmetics - bonding, veneers, all ceramic crowns to achieve optimal esthetic result. General dentistry - fillings, root canals, cleanings, gum scaling and root plannings, laser gum surgeries. This is the oldest technique. Bulky palate, messy adhesives, requires multiple adjustments. Traditional dentures end to get loose as bone resorbs without teeth or dental implants over the years. Typically functions 5-20% of the natural teeth. Also check out link Truth about Dentures. Also known as implant overdentures. Similar to traditional dentures but more stable. Bulky. Removable and need to remove every night. Typically require 2 to 6 dental implants. The snaps require replacement every 1-3 years and acrylic dentures would also require much maintenance as denture base frequently fractures and denture teeth frequently break off. We do not do this procedure in our implant center due to the expensive maintenance that is required (from worn metal house to fractured restorations). If you are interested in this procedure, typically we gave you a better alternative. Our solution is make it half and half, which means half fixed teeth and half removable teeth. For example, you can have 8 front teeth supported by fixed bridge (via 4 dental implants) and back teeth supported by removable partial denture. All-on-four on denture teeth - notice the bulkier nature and excessive bulk of the restoration. This method has recently gotten lots of publicity. All on four was invented as a more economical solution for patients missing their teeth. Many times, the surgeon need to remove additional bone because extra space is required to fabricate the pink base which can be traumatic to the patient. Typically this procedure frequently uses denture teeth which can break easily. The restoration is usually done by a way of "hybrid" bridge which can have big compromise in function such as food getting stuck under the bridge. Patient are usually unable to eat the hard food because of potential weak strength on the four dental implants. 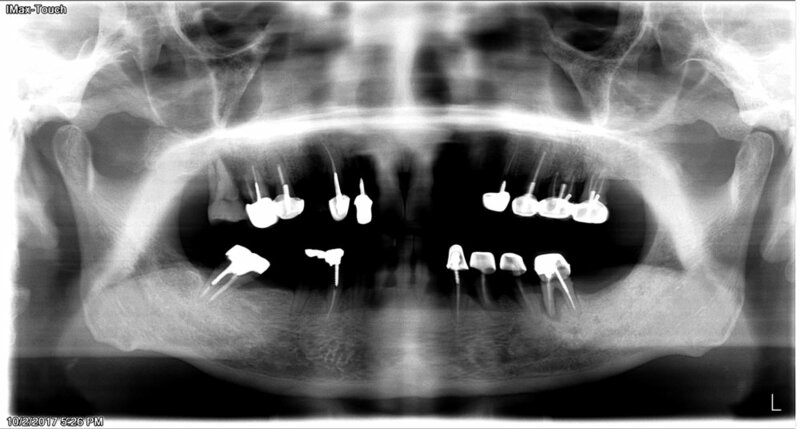 If one of the four dental implants breaks from excessive force, this can lead to collapse of the entire restorations. Our dental office, as well as many well known dental implant experts in the field, are moving away from this type of treatments. Example of All on 8 restoration : 8 dental implants is used to support 14 Porcelain (full zirconia) teeth. The size restoration resemble very close to the teeth you lost. This is considered the "Mercedes of teeth replacement". It is the best way to replacing teeth. Having 8 dental implants equally spread out over the arch will equally disperse the chewing force. This is the most natural and most functional way of replacing missing full arch of teeth. Eight dental implants may seem like alot, but it is actually less invasive because surgeons do not need to remove additional bone like the All-on-4 procedures frequently requires. 1. First complimentary visit for evaluation of patients medical and dental history. CBCT is taken to evaluate bone height and volume. Thorough patient discussion regarding expectations, time frame, procedural process, and schedule for surgery. 2. Surgery scheduled for the All-on-8 procedure. At this appointment, the surgeon will remove any hopeless teeth, place implants, and place bone grafts if needed, create an esthetic and functional fixed temporary teeth. Many of our patients appreciates a single visit surgery approach to minimize discomfort. Patient can usually eat the same day with very little postoperative pain. 3. Postop visit after 1 week to remove stitches. 4. 3-6 months later, the bone will grow hard around the implants (osseointegration period). At this time, impression is made for final zirconia bridge. 5. Insertion of final zirconia bridge. Eight benefit of All-on-8 Immediate Loading Procedure - you get fixed teeth you can eat on the same day! Dr.Chen has immense experience and technique in the All-on-8 immediate loading procedure with near 100% success rates. Full arch Immediate loading is a technique-sensitive procedure in which only a very few dental implantologist can perform. If done well, this procedure offers many advantages. 1. Less time. - You will save time by having all the teeth removed and implants placed at the same visits. This procedure is especially suitable for out of state patients. 2. Less surgery - You will not need to do additional surgery, especially the second stage surgery which implants are uncovered from the gum. 3. Less pain - Less surgery means less pain for you. 4. Same day temporary teeth that can eat right away - Same day fixed temporary that functions similar to real teeth. Again, this will be fixed and you do not need to remove the temporary teeth every night. You should be able to eat all soft-normal food easily. 5. stronger bone - Studies have shown that when implants are immediately loaded, there will be stronger bone grown around the implants, which means the implants are more stable and can withstand more force compare to the tradtional approach (non-immediate loaded implants). 6. higher success rate - All-on-8 immediate loading actually have higher success rate. Traditionally, after the implants are placed in patients without any teeth, patients are told to wear complete removable dentures. By wearing dentures in the healing phase, it will cause many complications such as opening of wound, high chance of implant failures due to rubbing force on the implants, and higher chance of bone graft failure due to forces being applied to the dentures. Having the implants immediately loaded, you will avoid all these complications and thus have higher success rate. Secondly, more dental implants means it will be stronger, especially in cases where patients wears the temporary teeth the same day where there are a lot of stresses being placed on those implants. Because Force = Stress/Area, if we want to decrease the stress placed on those dental implants, we need to increase the surface area of the implants into bone. And the best way to increase the surface area is to increase the number of dental implants being placed. As comparison, All on 8 dental implants procedures has a lot more dental implants in the bone compare to all on 4 dental implant procedure. 7. Preserve more of your bone - The bone in our jaw melts away when they are not being loaded or used. This is bad news because bone is what gives support to our face and musculature, without bone, this can lead to a very old and saggy look. The good news is that the dental implants can preserve more bone. Not only will the bone gets preserved around dental implants, the bone will actually get stronger with dental implants because it gets used more and the body responds by making more bone cells (osteocytes). All on four dental implants does preserve bone in your jaw also but ONLY around those four implant. The areas of jaw without dental implants will continue to experience bone loss. 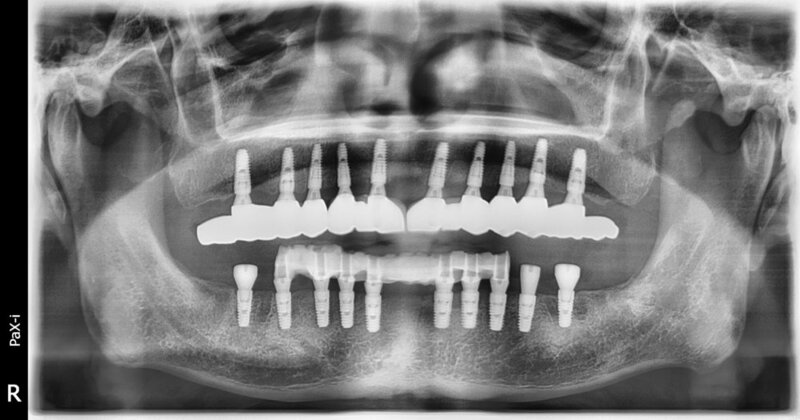 In an All on 8 dental implants case, those 8 dental implants will be evenly distributed throughout the jaw and bone will get preserved around all 8 of those implants. Secondly, all on 8 procedure DO NOT need to remove your own bone for the procedure to work. This is why the final restoration of an all-on-8 procedure is a lot smaller than all-on-4 restorations. All-on-4 restorations REQUIRES BONE REMOVAL for the procedure to work because it is necessary for the added strength of the restoration. This has several negative impacts including losing your bone, bigger and heavier unnatural looking restorations, and god forbid, if any of the 4 implants fail (Dental implants success rate is 95-98%, not 100%), it will be very difficult to replace the failed implant because so much bone has already being lost. 8. Better cosmetic result - Because you have temporary teeth to look and function right away, you will 'test trial' your smile and changes can be made for a better final result. What are All-on-6 and All-on-7 dental implant procedures? 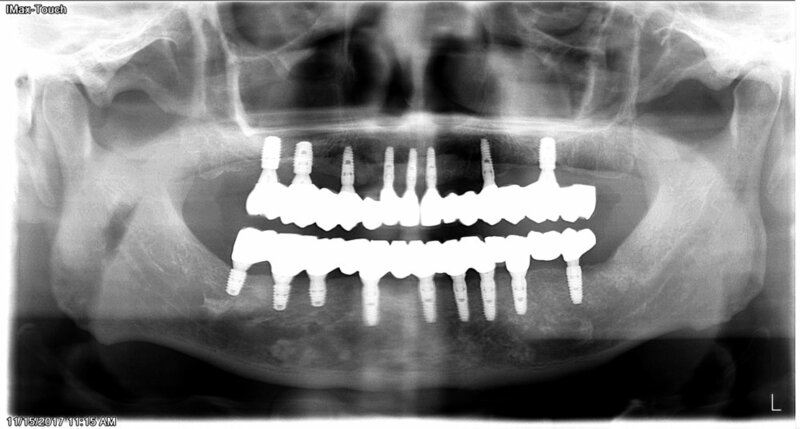 All-on-six and All-on-seven dental implant procedure is similar to the all on 8 procedure but with 1 or 2 less implants. This may be a candidate for some patients will wants to have a cheaper alternative. However, not all patients are candidates because with reduced number of dental implants, there will frequently be a reduction in strength. How our all-on-8 dental implants stand out from the crowd? Many other dental offices also offer all-on-8 dental implants, but they do it the traditional way. What makes us different? Here are few ways that makes us stand out from other implant centers. 1. Personalized care: Many other implant center are corporate owned which means they have rotating door of associates doctors that comes and goes. Frequently doctors in these office do not stay very long and many times you are unable to find the same doctor if any problem arises in the future. You also do not get the personalized care you deserve. In addition, you have different doctor that treat your case, for example, one doctor can place the implant and a different doctor restores the dental implants. Many times, with different doctors treating your case, communication can be lost and you might have a compromised result. Our office is owned by Dr.Chen and he is the only doctors that will be treating your case, from beginning(surgery) to end (restoration). 2. Ability to do immediate loading and patient function with their new teeth the same day. 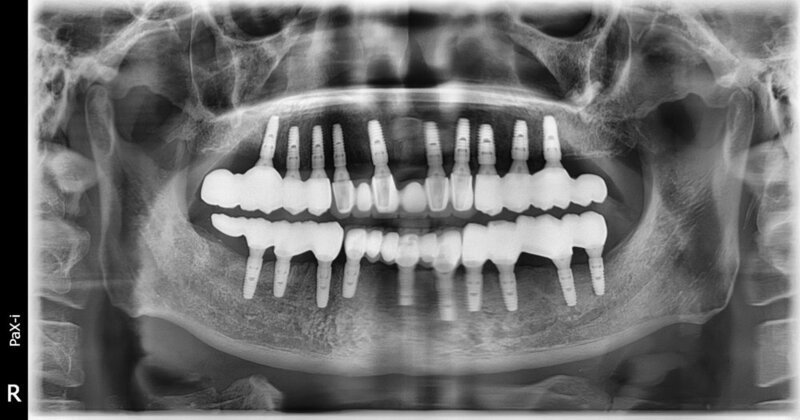 Simply put, most other office's all-on-8 dental implant procedures are NOT immediately loaded. Patients typically have all their teeth removed and was given a removable complete denture in which they cannot eat with, especially from the tender and swollen gums from the fresh extraction sites. Patient will function with this removable complete denture for 4-6 months. After 4-6 months, a surgery appointment is schedule to have their 8 implants placed in the mouth and then the patient need to wear the SAME removable complete denture again for 4-6 months. Again, this cause more pain to the patient because the gums are still sore from the surgical procedure and makes the denture very painful to wear. In addition, by wearing denture over buried dental implants will greatly cause increase in dental implant infection and failure due to dentures rubbing on the implants. After another 4-6 months, patient are finally back to have their dental implants restored - many times, with less than ideal porcelain fused to metal (PFM) crowns. Our office does it completely differently. We extract teeth, place implants, and make fixed temporary restorations in which patients can actually eat with the SAME DAY. The success way is much higher than the traditional way and because the implants are immediately loaded, studies shows that the bone actually grows stronger around those implants. 3. Better design and materials: Many other office uses the traditional PFM (porcelain fused to metal crowns) which frequently chips and fractures after long term use. PFM are hand made by technicians which may have imprecise fit. Typically, 14 teeth is required in a complete dental arch, from the upper right second molar and upper left second molar. Many implant centers do not replace the entire 14 teeth, they only replace about 10-12 teeth which really limits patient's ability to chew. Additionally, many other implant centers (especially ones in foreign countries), do not use conventional dental implants. They are actually mini dental implants which look like a nail that fractures very easily. On our dental implant center, we design your restoration so that it has the potential to last a lifetime and functions as close to your natural teeth as possible. You will get 14 teeth in a arch from left second molar to left second molar. The restorations are made by zirconia which is the strongest dental restorative available today that almost never chips or fractures. Zirconia restorations are not made by human hand, it is laser scanned and milled through the latest cad cam technology. The fit of the zirconia restoration is more precise than the traditinoal PFM. Additionally, we use premium FDA approved conventional dental implants that is supported by years of research. We choose our dental implants base on their long term stability of maintain bone and gum, as well as their overall strength. 1. Consultation with Dr.Chen with 3D scan. Evaluate medical health and dental conditions. Discuss treatment goals, time frame, number of visits and fees. Surgical appointment is scheduled. Initial consultations evaluate patients existing teeth and bone. 3D CBCT scan will be taken to determine patient's existing dental condition, volume of bone and anatomy. 2. Surgical visits - Extraction, implant placement and delivery of same day temporary restoration. Usually takes about 2-3 hours and performed under local anesthesia. Patient usually returns 1 week later for postop. After the postop visit, patient usually returns 5-6 months later for restorative work. Extraction, Implant, and temporary restoration on the same day. Patient will be able to function and eat with this for period of 5-6 months. During the surgical visit, temporary teeth (reinforced by a metal wire) is delievered the same day. 3. Restorative visits -Impression and delivery of final restoration. This step usually usually takes about 1 month to complete. Teeth will be designed to best match patient's facial esthetics. Final zirconia bridge is delivered. 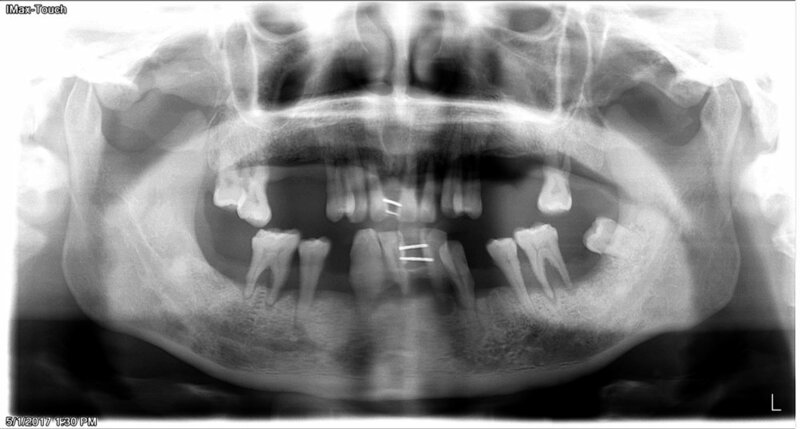 Case 1: This patient presents with severely mobile teeth caused by periodontal disease. Patient only had 3 teeth remaining on the lower arch which makes it very difficult to eat. Patient had been very frustrated because many dentist had told her that she cannot get dental implants due to inadequate bone, especially around the sinus area. 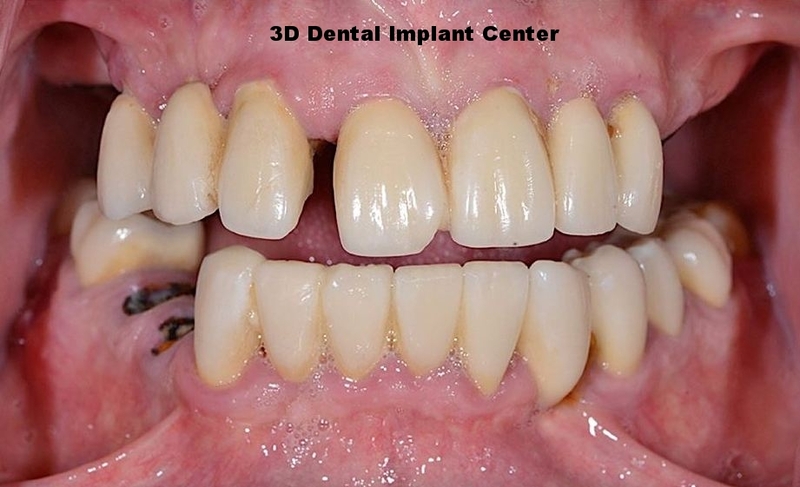 We had performed upper and lower all on 8 dental implant procedure on this patient. All teeth were extracted, bone grafted and dental implants were placed on the upper arch the first day, and then performed the same thing on the lower arch on next day. Patient wore the fixed temporaries (which was reinforced by metal wires) for period of 6 months. After 6 months of having the temporaries, we took the final impression and delivered the final restorations (video below). Case #2: Patient presents with teeth that kept giving him pain despite undergoing years of root canal treatments and gum disease treatments. We discussed treatment options and planned for upper and lower all on 8. All his upper teeth were extracted, bone grafted, dental implant placed on the first day, and did the same thing on his lower teeth few days later. Final prosthesis was delivered 6 months later. Patient is very happy with the result. Caese 3: Another full arch mouth implnat - patient is very happy. Patient had consultation in another dental office who told him full arch implants would require 40 visits and cost more than double on what we charge. We were able to perform the procedure in less than 10 visits total. Case #4: This 60 year old male patient came in with severe periodontal disease. Note that he already had dental implants done in another office 1 year ago. You can see the dental implants on lower right side is getting bone loss.This 60 year old male patient came in with severe periodontal disease. Note that he already had dental implants done in another office 1 year ago. You can see the dental implants on lower right side is getting bone loss. All upper implants has been placed in our office. Note that lower right implant (done in another office) continues to have bone loss. They will eventually fall out and would require extensive bone grafting. 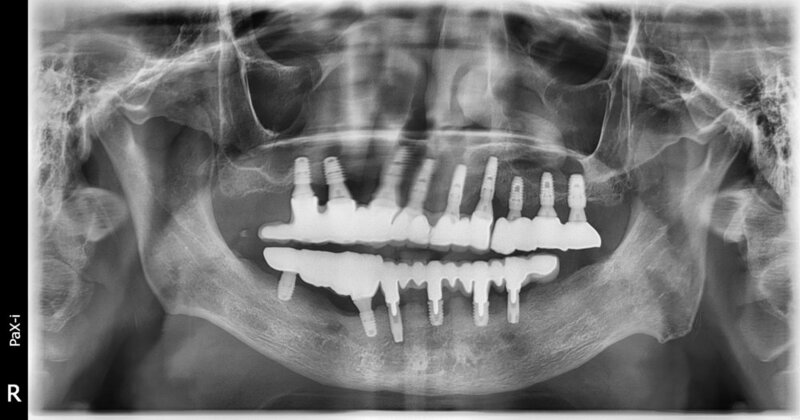 Patient are able to get more dental implants on lower right side if he's lucky and bone loss is not extenisve. If bone loss is extensive on failing implant, patient might not have enough bone for further dental implants in that area. This is an example it is very important to find a good, experienced and skilled clinician to do these procedures because sometimes you really only have 'one chance'. Upper implant in temporary phase. Note the amount of bone loss on the lower right implants that was done by another office. There can be many reasons that can lead to this type of failure, it takes an experienced clinician to avoid these type of issues. These failing implant would need to be removed and bone grafted, hopefully, new dental implants can be placed. 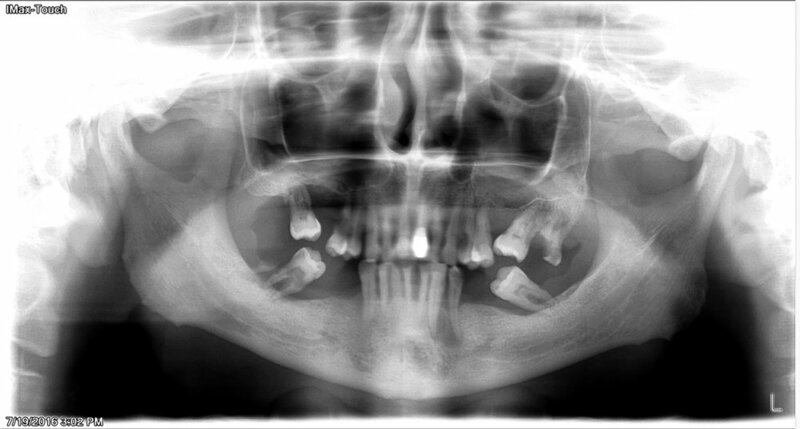 Case #5 : Patient with terminal dentition. Patient states he cannot tolerate removable dentures due to gag reflex. Before - patient have very loose bridge and cannot eat. Patient also have severe gag reflex and CANNOT tolearte removable full dentures. After - full mouth implants placed. Patient cannot eat and without being embarrassed with teeth coming loose. Another very happy patient. 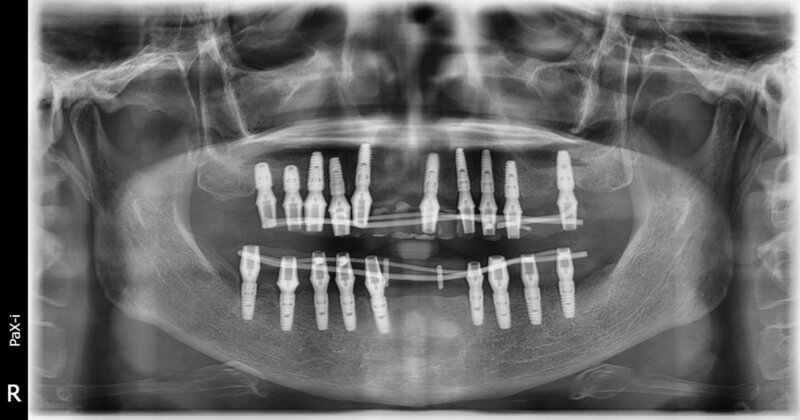 Case #6: This patient found us on the internet and wanted to get the All-on-8 procedure done. Patient has mouth full of cavities and broken back teeth. We presented options to patients and patient accepted our recommendation of saving his upper and lower front teeth and only have dental implants in the back teeth. Patient was very happy with the final result and even write us a positive review on Yelp (click here). Before - Patient suffers from full mouth decay and broken down dentition. After - Patient was given options. It was decided to maintain his front teeth and have dental implants on back teeth. Another happy patient. Case 7: Patient in his forties. All on 8 is great for younger patients who lost all their teeth. No other full arch implant option can provide such longevity. If patient had an all-on-four procedure done, if one of the implant were to fail, patient would be left with no teeth and would cost alot of time and money to fix. 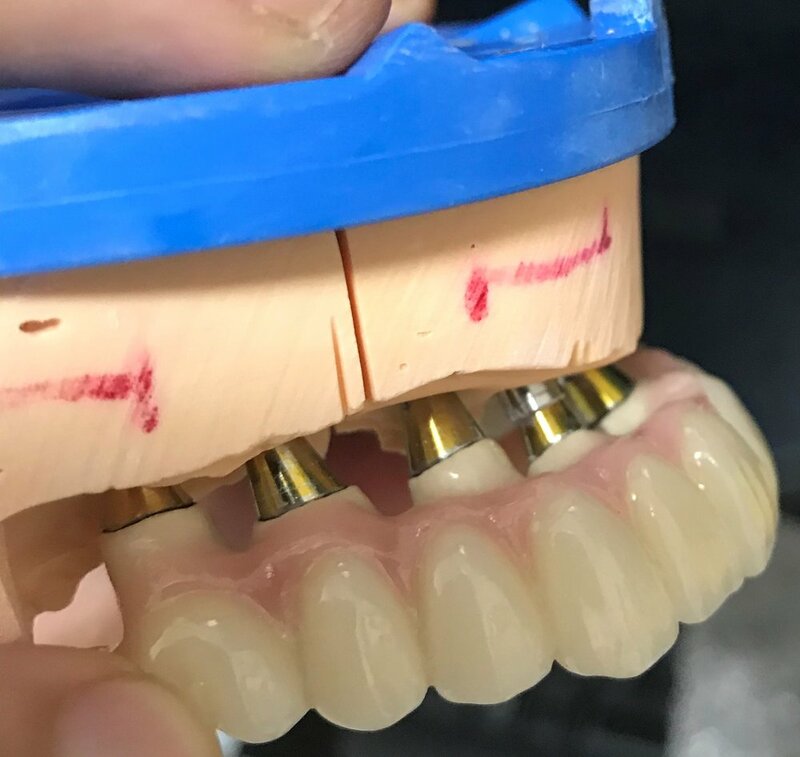 Because all on -8 procedure are divided into sections, if one of the implant were to fail (knock on wood), patient would still have majority of his/her teeth and we just need to replace that one single implant. Thus, by doing it right the first time would really be the best way to go. Case 8: Even though our primary goal is restore function so patient can eat, but we also try to achieve good cosmetics so patient can look and feel good. Patient would be able to test run their smile with their temporary teeth, then we analyze patient's smile base on solid facial esthetic principles such as teeth shape, size, color, shade, smile arch line, lip at rest position and phonetics. We are able to control teeth position very well, but we cannot control gum position if patient has already had alot of pre-existing loss of bone and gums. Case #9: Another young patient coming in with gummy smile and severe perio. Patient was happy with the restoration and the implants. Patient presents with gummy smile and missing teeth due to severe periodontal disease. All her teeth were extracted and patient is in temporary. We also had to trim away her excess gum and corrected her smile line. Temporary are not as pretty as the final restoration but still an improvement compare to her original teeth. Immediately after the final restorations, a big improvement with what she very started with. I saw the patient recently and snatched another photo with my iphone. Patient still very happy. 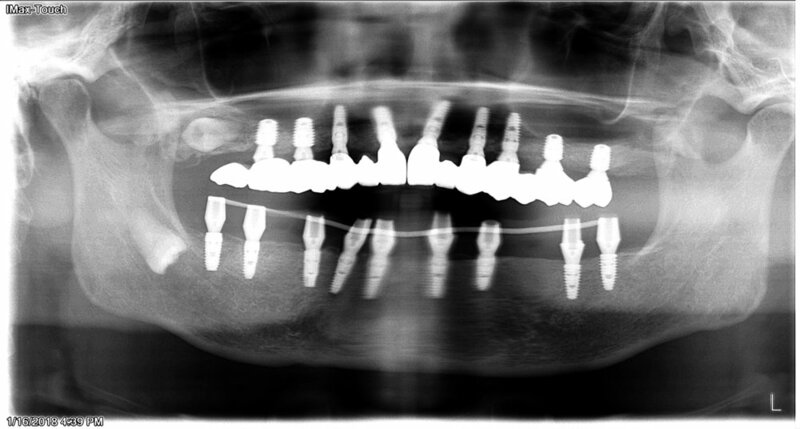 Case 10: This patient has history of failed implants and severely deficient upper jaw bone. We artistically bulge out the prosthesis to give him a more natural appearance. Case #11: Patient came with in with missing teeth with squished (collapsed) bite. We opened her bite with dental implants with improves functional and cosmetic result. 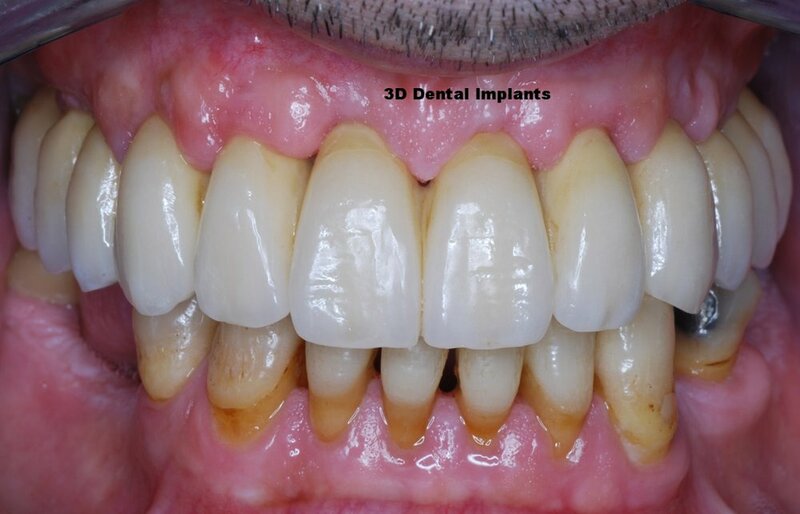 Case #12: Full arch implant restorations on a patient with severe gum disease. Case #16: Full mouth dental implants on patients with severe worn down teeth. 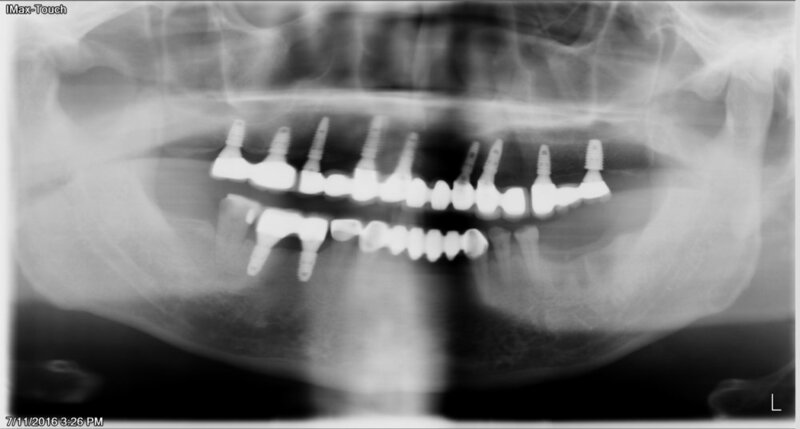 Case #19: upper full arch implant with explanation of PFM crown with metal reforcement. 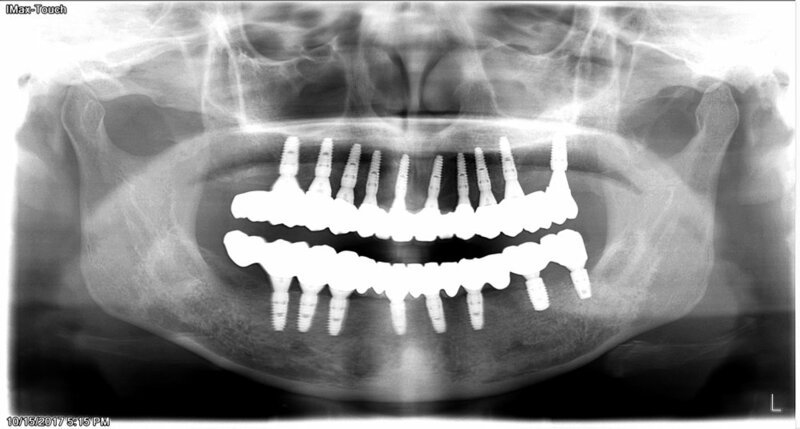 Upper Arch supported by 8 implant. Upper arch supported by 9 implants. 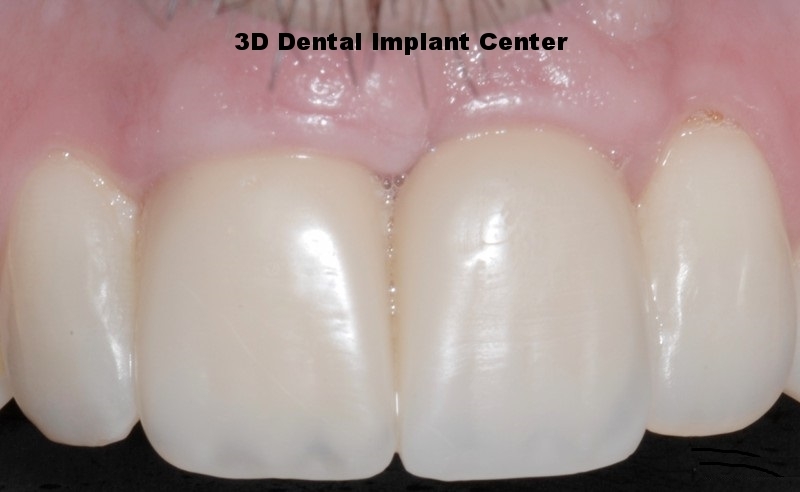 An extra implant was placed beyond the 8 implant due to poor bone quality and was better able to distribute the stress. Before. - Pt suffers from periodontal disease that requires full mouth exttraction. Before - Patient want to maintain his natural teeth , but cannot eat with partial dentures. After - with few dental implants, patient can now eat whatever he wants. After - upper full mouth implant; maintained lower front teeth due to budget. before - lower bridge kept coming off with gross decay under the bridge. Patient always gets embarassed in social settings. Before - Patient states not being able to eat steak for years. After - Patient can now eat anything he wants. Before - pain on lower teeth; Patient do not want to wear complete dentures due to fear of changing face shape. 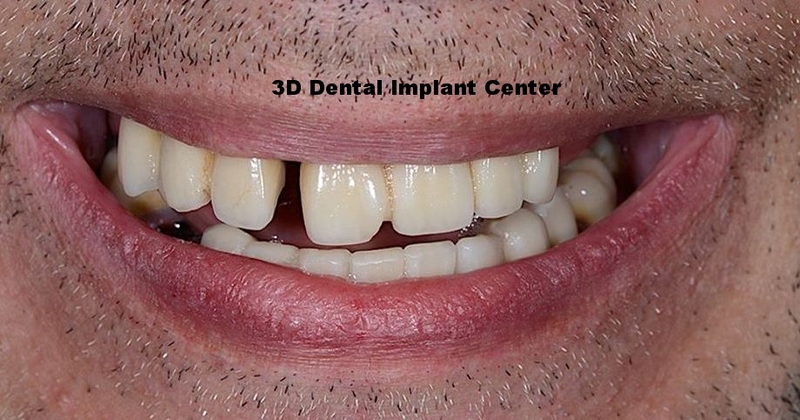 Afer - Dental implants was placed and patient can maintain his bone and facial musculature. Before - lower teeth was very loose due to periodontal disease. After - implant placed and function is restored. Patient want to keep lower right wisdom teeth for now. Before, patient cannot eat and is in pain; Patient also have a tight budget. After - implants was placed on back teeth to restore function and maintain vertical dimension and facial musculature; Patient plans to get dental implants on front teeth in 2-3 years and budget allows. This 35 year old male patient came to office with sever periodontal disease and is having hard time eating. Full mouth implant was placed in 2016; Function , cosmetic , self confidence is restored. Patient came back in March 2018. As you can see, after two and a half year later, the implants looks like it was placed yesterday with no bone loss. Patient is very happy.